But anyway, to accommodate such deluges, the ‘ditches’ that are provided are usually deep and voluminous – so much so that the one in front of the complex, by the roadside, was two meters deep and housed non-too-small turtles all year round. Mind you, the water wasn’t that deep, more along the lines of 10-20 centimeters, but the capacity was there. Out back, the channel was even larger, easily capable of handling a small boat, and I never did determine how deep it was. 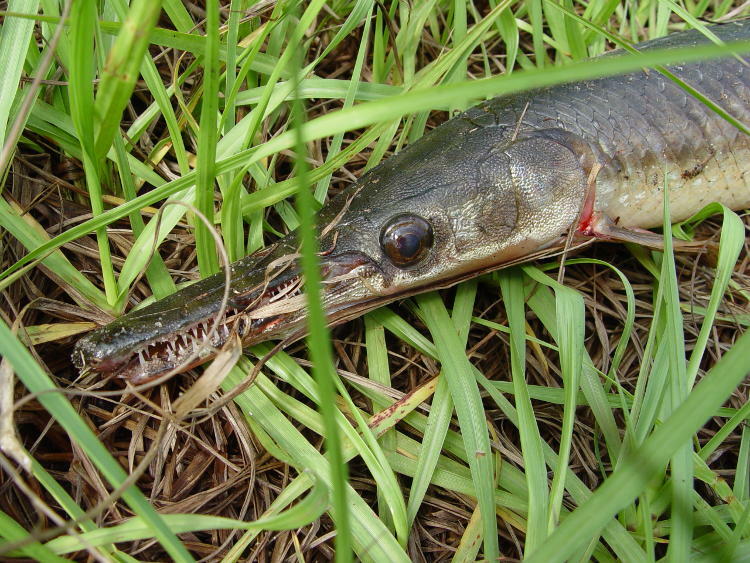 On the same day that this was taken, I happened across a Florida gar (Lepisosteus platyrhincus) lying in the grass near the channel – rather curiously, when I thought about it. Somewhere around 50-60 cm in length, it was still alive, and not far from the water but not immediately alongside it either, with the surface being some 2 meters away laterally and one beneath it. I initially suspected that it had been caught by a fisherman and left there, but there was no visible hook injury and it seemed odd that, if an unwanted catch, it would be discarded there and not simply tossed back in. But it also seemed like a good distance to have jumped on its own accord. We had otters that foraged in the area, and of course countless wading birds, but again, no visible injuries. Eyeing those teeth warily, I picked it up and tossed it back into the channel.